Show Runs: April 7th-April 20th, 2013. The all-alpha-female world of the San Diego Derby Darlings can seem like an alternate universe filled with new rules, new names, new spouses, and new identities. 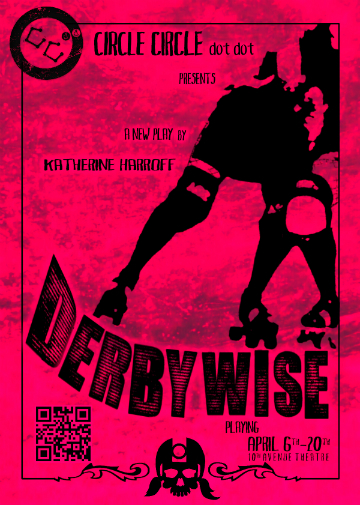 Circle Circle dot dot's latest original production "DerbyWise" is a journey through the eyes of a budding Roller Derby star Erika "Jezebel" Simms, who takes on this new world and all of the complications that this endeavor entails. Throughout her history as a Darling, Jezebel is faced with much turmoil from her teammates- but it's what's going on within the athlete that sets this story in motion, and asks audiences the question: is it the woman that makes the Derby, or the Derby that makes the woman? CCdd Artistic Director Katherine Harroff is thrilled to take on "DerbyWise" as a playwright & director after interviewing members of the San Diego Derby Dolls for inspiration. "I am thrilled that this all-female cast is able to explore a truly character-driven story that gives voice to this powerful, feminine, and in many cases unknown sub-culture. 'DerbyWise' is not a piece about girly-girls. It's a play about strong women with strong voices finding their place in an aggressive and addictive sport. These girls are worth fearing and idolizing all at once." - Katherine Harroff. *Adult language is used in this production. HOW TO BUY TICKETS: Tickets for Derbywise are available only at www.circle2dot2.com before the show, or by e-mailing circle@circle2dot2.com for reservations. Cast and crew will be announced soon!